Stevens Pass, WA – Stevens Pass is honoring the Washington State ski and snowboard resort’s 75th anniversary this winter and the resort is celebrating with a season full of events and more than $1 million in improvements by the resort’s new ownership group, including new state-of-the-art grooming equipment, extensive summer tree glading and new, more convenient lift ticket options. “We are excited to share our 75th anniversary with our new and loyal guests. 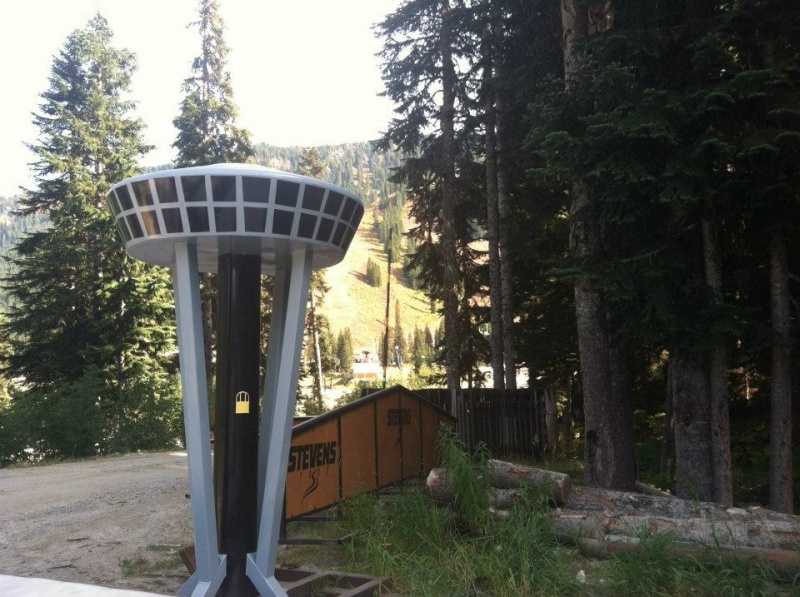 I invite everyone to come out, see the new improvements and experience the best the Northwest has to offer,” says Chris Danforth, Vice President of Marketing and Sales at Stevens Pass. Stevens’ summer grooming department, which consists of eleven workers, has been busy creating new lines and opening up gladed tree areas from one side of the resort to the other. Notable regions of brush clearing, tree limb cutting, and trail maintenance include Corona Bowl, the Aquarius zone, and the area in between Wild Katz and Double Diamond runs. These areas, normally overrun by brush, are now open offering intermediate to advanced skiers and snowboarders a better experience than ever, plus guests can spread out and discover new powder runs on snowy days. This summer the resort’s terrain park crew has been busy increasing and improving their fleet of boxes and rails with hopes of having more than 40 brand new, non-snow features ready to launch by season’s start. These include the new Space Needle Bonk, a 10-foot replica of the Seattle tower that can be tapped, slid, or soared over. Two new satellite parks will also allow Stevens to place features on the front side of the mountain, creating more fun and unique rail zones. These areas are specifically designed for lower level riders to get them used to the feel of terrain features and progressing faster than ever. This season skiers and snowboarders will no longer need a specialized pass to enter the park. The mountain does, however, still recommend that all skiers and snowboarders wear a helmet and follow the rules of safety and etiquette. Three new Pisten Bully 400 Park Cats were added to the Stevens Pass grooming fleet this summer allowing the mountain to expand its grooming schedule and cover more terrain each night. This year guests will notice more pristinely groomed terrain and fresh corduroy each morning, perfect for making big sweeping turns. At its heart, though, the Pisten Bully 400 is designed for the rigors of park development with strength and agility to let builders create almost anything their minds can conjure. The extreme range of motion of the front blade lets the park builders push, carry and place snow exactly where they need it. Plus the 400’s increased range of motion at the rear means the Alpine Flex tiller can put that finishing touch high up on the wall of a feature. The Pisten Bully snowcats are specially designed for a wide range of mountain needs including the ability to groom steep terrain, and with 370 horsepower they have plenty of guts to accomplish any task quickly and efficiently. This winter, Stevens Pass will be the only resort in the region to offer an innovative Flex Ticketing program that allows guests to ski on their schedule, not the resort’s. Instead of traditional all-day or half-day afternoon tickets, skiers and snowboarders at Stevens Pass can now purchase 4 or 8-Hour Flex Tickets good any time of the day that don’t begin until the guest takes their first run. Now families can come and go as they please because they always get their full value. And, without the mad rush to be on the chair by 9 a.m., both traffic and parking congestion is reduced. Flex tickets also extend into the night when the resort is open past 5 p.m. The youngest riders, however, won’t need purchased tickets at all. This season, families can bring their children, ages six and under, up to explore the mountain completely free of charge. Guests should purchase or renew their child’s pass online to ensure season long direct-to-lift access. The nearby town of Leavenworth gives guests a unique opportunity to stay and play. From their annual Christmas tree lighting to Stevens’ Ice Fest Rail Jam, there is always something to see and do in this historic, Bavarian-themed town. Packages for two people, which include lodging and 8-Hour lift tickets begin at$149 per night. Guests who have a season pass to any other resort can ski or ride for free and get a night of lodging for two people for just $89. New this season, Stevens has partnered with veteran winter resort mobile app builder Resorts Tapped out of Jackson Hole, Wyo. Free for both iPhone and Android, this app lets users track all aspects of their day including vertical feet, distance traveled, top speed, and more. Using the “check-in” feature, guests can locate themselves on the digital trail map and pinpoint their friends. The app also produces a simulated playback at the end of the day so visitors can relive their routes and share them with family and friends. Beyond tracking, the Stevens Pass app provides users easy access to weather conditions, webcams, trail updates, and social networks. Stevens Pass is an awesome resort. The glade clearing efforts have made for amazing tree skiing front and back side. Stoked to see the additional space especially near Wild Katz/DD!